"If I gave you my luckiest charm/ If I swore that I’d do you no harm/ If I promised you peaches and plums/ Would you pep up and not be so glum?" 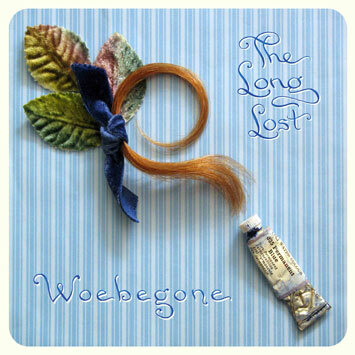 – "Woebegone"
After 4 years apart, they formed The Long Lost during a renewed courtship in 1998. In contrast to the avant-electronics and hip-hop aesthetics of Alfred's music as Daedelus, The Long Lost is a union of two songwriters & producers with a penchant for sad sounds and delicate, electro-acoustic melodies. These two hopeless romantics make psychedelic lullabies for lovers and the lovelorn. Nowhere is this demonstrated more clearly than on the "Woebegone" EP. "The Art of Kissing" is an exquisite Brazilian-influenced number whose stillness and poise is in fact driven hard by frantic brushed drums (the lovers’ heartbeats?). "Woebegone" goes folkways for an achingly beautiful ballad, both familiar and strange. As well as Sa-Ra, Laura has also sung for Flying Lotus and here the favour is returned with a remarkable remix from the man himself completing the package and taking "Woebegone" in a startling alternate direction.